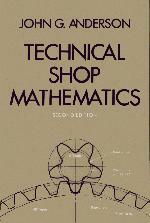 Suitable for home study, classroom use, or as a superior reference guide for the shop professional, this practical text presents a review and introduction to basic shop mathematics in a straightforward manner. Offers a logical format that progresses from arithmetical operations through measurement systems to basic algebra for shop-formula solving skills, practical geometry with shop examples and applications, and trigonometry. Contains numerous shop-related problems requiring practical application of principles. Includes a wealth of worked-out study examples designed to reinforce concepts. The Number System. Fractions and Mixed Numbers. Decimals and Decimal Fractions. Exponents, Power, Roots, and Percentages. Measurement-English and Metric (SI) Units. Fundamentals of Algebra. Ratio and Proportion-Gear Ratios. Shop Formulas. Tapers and Related Tooling Calculations . Geometry-Lines, Angles, and Plane Figures. Geometry-Axioms, The Number System. Fractions and Mixed Numbers. Decimals and Decimal Fractions. Exponents, Power, Roots, and Percentages. Measurement-English and Metric (SI) Units. Fundamentals of Algebra. Ratio and Proportion-Gear Ratios. Shop Formulas. Tapers and Related Tooling Calculations. Geometry-Lines, Angles, and Plane Figures. Geometry-Axioms, Postulates, and Propositions. Geometry-Triangles and Quadrilaterals. Geometry-The Circle. Geometry-Surface Areas and Volumes of Solids. Right-Angle Trigonometry. Shop Trigonometry.